When you look at the map, it seems daunting at first. So many states to cross; so many kilometres to cover. That’s before you realise that people sometimes zip from Mumbai to Delhi in a matter of 24 hours. But you would try to do this drive in a day only if you weren’t looking for a holiday. If, like us, you’re planning on stopping at places en route and soaking in the beauty of the journey and not just the destination, then this is a drive worth doing over, five, six or even seven days. We set off one bright, sunny morning, having strapped ourselves comfortably in an Innova. It was a good start: the weather was pleasant, we had peppy music and had thoughtfully stacked up on food and drinks. Driving through Maharashtra was wonderful. The roads lay wrapped in miles of greenery, occasionally separated by calm rivers. We took a detour to Daman, where we stopped for a bite and spent some time lazily lying on Devka Beach. Further on, the roads in Gujarat were lined by factories; at some places, there were fields on one side and power plants on the other, providing a distinct contrast. The drive went fine till we reached Surat, from where construction work for a new highway was going on up to Vadodara. This stretch was replete with rough patches, heavy traffic, diversions and narrow lanes. We took 7 hrs to complete a drive that should have taken just three. When we reached Vadodara, we were so relieved that we hit the bed without even bothering to eat. We explored Vadodara the next day and then off we were on the road again. If the Surat-Vadodara stretch was a nightmare, what followed seemed like something aimed to make amends. The Mahatma Gandhi Expressway, or the National Expressway 1, between Vadodara and Ahmedabad, was a dream road on which we practically flew in less than an hour. This expressway has been planned so well that the dividers have foliage standing tall at 5 to 6 feet, so that while driving at night, headlights do not distract drivers on either side. There’s one thing to remember, however, before hitting this road: carry food and water, and take a restroom break. There isn’t much you’re going to find on this stretch till you reach Ahmedabad. 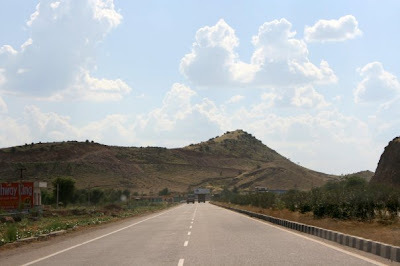 We drove on to Udaipur, a long journey that didn’t seem tough because of the fabulous roads. Cornfields and rice plantations on either side of the road added a green touch, and the delicious food at the dhabas lifted our spirits. Stone mountains lined the road as we drove into Udaipur, where we checked into a heritage property. The next day, we set off from Udaipur to Delhi. It was an exhausting drive, but the roadside vistas made it easier. All around us were barren mountains, tiny temples, black-faced langurs, and camel carts loaded with fruits and vegetables. We had our run in with absurd truckers and that perennial bane of anyone driving in India: cattle that refuse to heed to horns or logic. First, a trucker cut us sharply at a toll booth and then mocked us like a teeny brat. Soon after, a cow ran madly in front of our car, forcing us to turn sharply. And then there was a donkey who insisted on standing in the middle of the road, quite unaffected by the swirling, honking traffic around it. Thus, with much incident, we reached Delhi, where after a day’s rest, we headed back to Mumbai. This time, we halted at Ajmer the first night and at Ahmedabad the next, so that the journey would be more comfortable. We also used our relaxed itinerary to discover dhabas in Rajasthan that serve authentic, delicious dal-baati-churma, and thus feeling pampered and rested, returned home. An excerpt from Outlook Traveller Getaways' latest book 'Driving Holidays in India'. Sure. I can send you a list of pit-stops through the journey. You could also pick up the Outlook Traveller Getaways' book 'Driving Holidays in India' for detailed info, if you need.